On a misty summer twilight, over three hundred people thronged the uneven old sidewalks of South Court Street, Medina’s grand historic neighborhood. 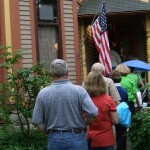 The occasion was “A Twilight Stroll Home Tour” sponsored by the South Court Street Historic Neighborhood Association. Six homes were open to visitors. The oldest was an 1838 Federal style structure, the newest was a 1934 Colonial Revival – and the remaining four were opulent Victorians from Medina’s Gilded Age. 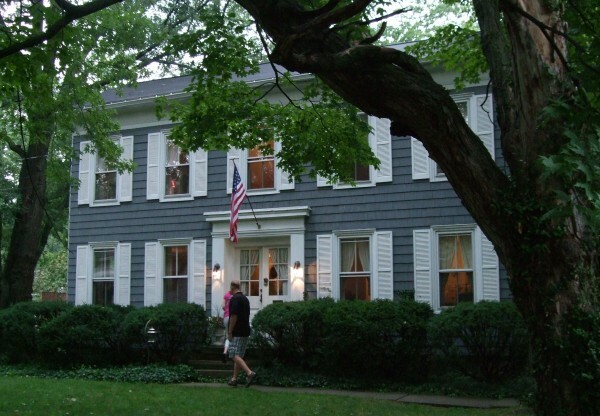 The houses in the neighborhood are a veritable time line of American architectural styles, ranging from early Western Reserve farmhouses with barns and remnants of orchards, through various Victorian and early 20th century styles, to the ranch homes of the post-WW II, Eisenhower era. 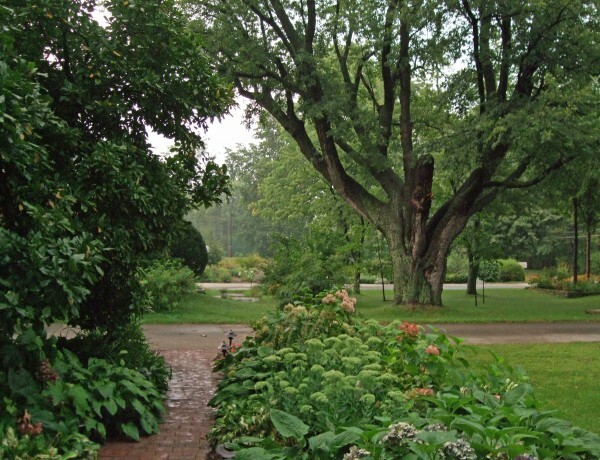 Since the area was farmland until after the Civil War when it became part of the village of Medina, the yards, in many cases, are unusually large and very lush. Many of the leading citizens of the village of Medina — prosperous merchants, bankers, attorneys and judges – chose to build their trophy homes on South Court Street. The roadway itself is historic as well. 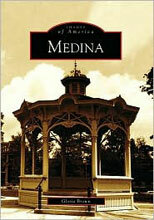 It began as a Native American trail and was later used by early settlers to penetrate into the thick forests of Medina County. In 1830, that stretch of road became part of the Wooster Pike (State Rt. 3), an important stagecoach route south. 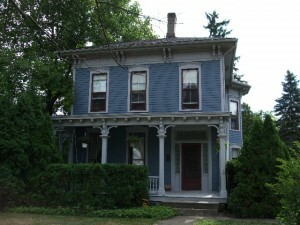 The oldest home on the street — and one of the oldest in Medina– is the 1838 Prentice-Kauffman home on 529 South Court Street. Barney Prentice ran a successful shoe store on the Square, and it was in his establishment in the Mechanics Block, the 1848 fire (the first of Medina’s two devastating fires) was believed to have originated. The current owners, the Kauffman family, have lived in the home since 1982 and, according to Barbara Kauffman, have had to do relatively little work on it. “We’ve only had to do cosmetic changes,” she explains. The second home on the tour was the Martin-Mayer home at 575 South Court Street. 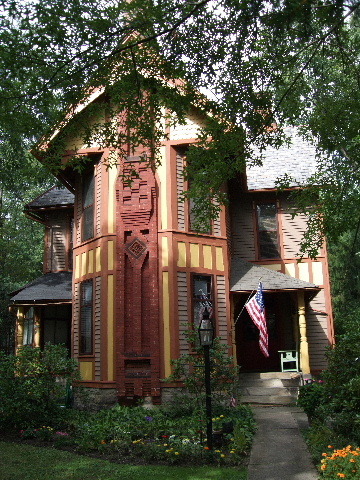 It boasts a melange of Victorian styles, including Queen Anne, Stick and Eastlake. 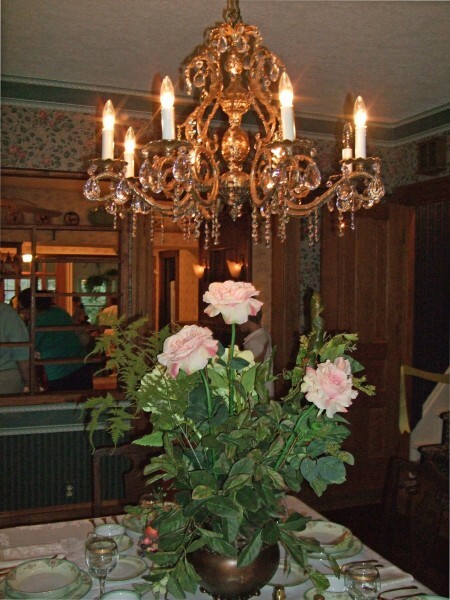 One of the main features of this home is the outstanding woodwork, still in pristine condition. There are also several stained glass windows and, like most Victorian houses, it features very high ceilings. Mrs. Mayer collects antique books and china from the Victorian period and her extensive collections add considerably to the charming ambiance of the home. A few short blocks away sits the 1883 Parker-Lamb house at 721 South Court Street, a Queen Anne style structure with Eastlake features. The first owner of the house, millwright Paul Parker, was fatally injured during the construction of the home. While hauling paving stones for the cellar, he tripped and one of the large pavers fell on him. He lingered for a few days, then died of internal injuries in an upstairs bedroom. The home fell on hard times in the early 20th century — as did many of the grand Victorians on the street — and was split up into apartments. One of the visitors to the home, Nancy Masi, said that she had been born in the front bedroom during the Depression. 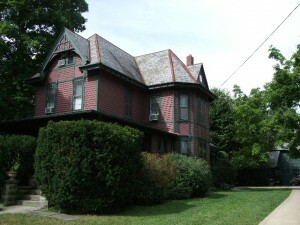 Currently, the house is owned by noted Medina potter, Elaine Lamb and her husband. The Lambs have done extensive restoration work. Furnished in a rich Victorian style and filled with Elaine Lamb’s award-winning pottery, the home features beautiful woodwork, high ceilings, stained glass windows and various nooks and crannies. The newest (historically speaking) house on the tour is 847 South Court St, which was built in 1934. Colonial Revival in style, it is a very spacious, airy home, and surprisingly opulent for having built built during the midst of the Great Depression when most Medina residents resorted to growing their own food and raising their own chickens to survive. 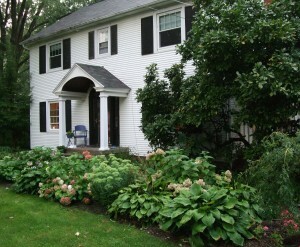 The Linden home is also surrounded by a very large and beautiful yard. The Sage-Edmonds home at 706 South Court Street is an 1875 Italianate Victorian with the requisite high ceilings, tall windows and extensive woodwork. It also features a large carriage house. The tour ended with the 1863 Beck-Kurilko home at 614 South Court Street. It is described as a Vernacular Victorian farmhouse and clearly hails back to the area’s rural beginnings. The home boasts numerous porches, and gardens that have been featured on numerous local garden tours. 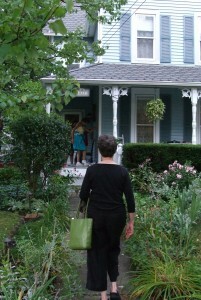 Pam Miller of Medina, approaches the front porch. Thanks so much for covering this tour. I was out of town and could not attend. I see it was a great success! Looks like it was a great tour. The history behind the homes is really interesting. Very well written, good content and useful for just about anybody. I will be visiting again in the future. Great post. I was checking continuously this weblog and I am impressed! Extremely useful info particularly the final half I take care of such information much. I used to be seeking this particular information for a very long. Thank you and best of luck. You actually make it seem so easy together with your presentation however I find this topic to be actually something which I believe I would by no means understand. It kind of feels too complex and very huge for me. I’m having a look ahead in your next put up, I’ll try to get the hold of it! de R$ 100.000.00 só na primeira período. It’s an amazing paragraph designed for all the web people; they will obtain advantage from it I am sure. your great writing, have a nice еvening! Very descriрtive blog, I enjoyed that bit. visiting this web page annd be updated with the most up-to-date gossip posted here.